I was contacted by Erik and Manuela a while back asking if there was a connection between the feline Bordatella vaccine and FIP. I asked them to send me Zorro's story and that I would post it so that perhaps, just maybe, other feline caretakers will read it and not be shamed (scared) into vaccinating their cat for more than what it needs. A cat vaccinated as a kitten does not need any more vaccinations except for what is required by law (rabies). Don't let any vet tell you otherwise. Have tissues handy as this will make you cry. On November 4, 2005, my wife Manuela and I took our beautiful, 10 and a half your old black cat Zorro to a Vet for a 4-in-1 vaccine. What transpired between those dates is on of the saddest things I've ever had to endure. I had made an appointment at Central Veterinary Associates for Zorro to have a routine exam and a 4-in-1 shot. He'd been getting these shots (and occasionally others) each and every year. At the time we didn't know better. We were brought into an examination room and were greeted by a doctor's aide - a kid who looked about 20 - who without even examining Zorro was already recommending a new, mite and tic powder that their office was selling. Although we had only booked the 4-in-1 shot, the doctor himself walked in with three things in his hand - the 4-in-1, a rabies vaccine, and Bordatella drops to put up Zorro's nose. When we questioned him, he said that we "had" to give Zorro the rabies - it was the law. This may be true, I'm not sure, but the year before Zorro had a 4-in-1 shot at another Vet, without getting a rabies shot. We explained that Zorro was an indoor, only housecat, but the Vet didn't care. He said we had to do it. Would he had called the police on us if we didn't let him do it? He proceeded to give Zorro the 4-in-1 and the rabies shot; Zorro didn't seem to mind the 4-in-1, but cried when the rabies shot went in. The doctor started to give him the Bordatella drops but we stopped him, asking what it was and why Zorro had to have it. He said it was to help Zorro to fight off upper respiratory problems and that all cats - especially older cats - should have it. We said that we hadn't booked that, the office staff hadn't said anything on the phone about it (they hadn't mentioned the rabies, either) and that we would wait and think about it. The Vet then said that it would be completely irresponsible not to give it to him, that all cats (even housecats) should have it and that he could see no reason for him not to get it. He shamed us into reluctantly agreeing. We had never heard of Bordatella before and trusted this man who is supposed to have our pet's best interests, not the all mighty dollar, as his basis for actions. Did I neglect to mention that he did examine Zorro before administering the vaccines? This examination took all of about 25 seconds - he looked in Zorro's eyes, ears and at his teeth. He quickly took his temperature with a rectal thermometer. There was no stethoscope involved at any time. After the nose drops went in, he started telling us that we "needed" to have bloodwork done for Zorro - the Vet's eyes probably saw dollar signs as he told us that the price was "only" $138. Not trusting him, we decided to wait. Needless to say, we left not happy with this veterinary office and vowed never to return. The next day, Zorro was asking a little strange, but we attributed this to him having a small reaction to the vaccines - he was usually a little down a day of two after getting a 4-in-1 shot, so we didn't make out of it. Over the next ten days, we noticed some very gradual changes. He wasn't eating as well as normal and he didn't have as much energy as normal, either. 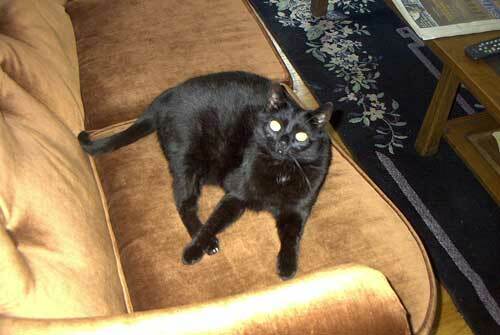 Normally Zorro was an extremely playful cat - even at 10 years old - and had a very hearty appetite. He seemed to be spending a lot of time under chairs, which was unusual for him. He also wanted to be on our 2nd floor balcony a lot; this was as far "out" as he ever got. This was not so unusual, except that now he wanted to spend more time there than usual, strange because it was getting colder outside. We started thinking he might have a low fever. Then came the strangest thing - he started eating his litter. Not a lot of it, but we assumed that eating any litter at all isn't good and we got nervous. On November 14, we called Central Veterinary Associates back and told them that we were nervous that the Bordatella, which we never asked for or wanted (not to mention the rabies vaccination) was making Zorro do strange things. I was speaking with office staff who said "absolutely not, there's no way anything we gave your cat could cause anything like that". I asked to speak to a doctor and I was told "NO". They said I could bring Zorro back in and a doctor would have a look at him. I felt like they were just after our money and said that I felt they should be responsible, if something they did caused our cat problems. They said "cats can always have reactions to things, we're in no way responsible if that happens". I asked again to speak to a doctor and was again told "NO - it's not possible, you have to bring him in". I complained more and they offered to waive the exam fee but said that we'd still be completely responsible for anything else they did. They didn't even seem sorry about the fact that our cat wasn't feeling well. I spoke with my wife about it and we decided that not only were they going to try to fleece us financially, but more importantly, based on our initial visit and then the subsequent reaction of the office staff on the phone, we just didn't trust them to give Zorro the care he needed. We asked some friends and called the place in our town called All Creatures Veterinary Hospital. The reaction at All Creatures was completely different. They seemed very caring and had no problem having a Vet call us back - even though we'd never even been there yet. The Vet called me and after I explained to him what had happened, he said something that shocked me: "I don't know why a Vet would give your cat Bordatella. We don't even carry that for cats - only for dogs. Indoor cats never need it; it's only for cats in catteries or boarding situations and even then it's rare that it's necessary". I was floored! The Vet at Central told us that "every cat should have it" and now I hear that our Zorro, being a housecat, absolutely didn't need it. I told the Vet at All Creatures everything that had happened, including the litter eating. He said that we could (not that we needed to) bring Zorro in for bloodwork, but that it was his cat, he would monitor him for a few days to see if he got better. He said that the important thing was that Zorro was eating, drinking and going to the bathroom. I think it is important to say that all through the ordeal - right up to the end - Zorro was as sweet as ever, purring every time we were close to him. We watched Zorro - he ate (though not as much as usual), he drank and he went to the bathroom. On about the 4th day after speaking to All Creatures, he ate a bit more than he had been (still not quite as much as usual) and had much more energy. We truly thought he was getting better. The next day he didn't eat much; we weren't letting him out on the balcony because it was getting colder, we still thought he might have a cold and that the chilly air might be bad for him. He started spending a lot of time at the buttom of the staircase near the door - this was the coldest spot in our apartment. Very, very unusual for him. We made an appointment at All Creatures. They examined him, thought his breathing might be a little laboured and did bloodwork. The Vet said he thought it might be bronchitis. They called the next day and said that he had an elevated white blood cell count and also high protein levels in his blood. They suggested to bring him in for a chest x-ray and worried that it might be pneumonia. I wanted to know more about this Bordatella; All Creatures said that they didn't know too much about it because they never gave it to cats. They don't even keep the feline version there - they have to order it when they need it. I called Central Veterinary Associates back. The office manager - Mary - told me there was no way that the Bordatella or anything that they gave Zorro could have caused any problems. I asked to speak to a doctor, she said "NO". I voiced my displeasure; she said "if you have a complaint, put it in writing". I said "I need to speak to a doctor - now". She said "I guess you're not too bright, you're not speaking with any doctor - any complaints, put them in writing". I answered "What good does it do to mail in a complaint to you if something bad is happening to my cat - that is retarded. I feel like going to the media about this". She hung up on me. I called back and was transferred to Eleanor; she started out very aggressive, telling me that I "spoke with the nice one already" (Mary??????) "and now I had to deal with her". I told her that I wanted to speak with a doctor because the doctor had pushed us into giving our cat Bordatella drops when we didn't want to and now I learned that these drops aren't necessary with housecats. She replied "you sound like an adult and you're having no trouble speaking with me - I'm sure that if you didn't want something you could have told the doctor." I asked her again to speak to a doctor (isn't that my right? ), she said "NO - you have a complaint, put it in writing. Your calls are no longer welcome here" and hung up the phone on me. I called back repeatedly and was either insulted, hung up on, or both. I spoke with Cathy, Diane, and Aaron, among others. Cathy was as rude as unfeeling as Mary and Eleanor, Aaron seemed indifferent and Diane listened and said the doctor would call back. One never did. I called later and was again hung up on. I tried again, they said they were calling the police, I said "I hope what happened to my cat happens to you so you know what it feels like" and hung up. This might not have been the nicest thing to say, but at this point I was so frustrated with their attitude and lack of caring that I said it anyway. A police officer called me later - he seemed understanding. I said I was only trying to speak with a doctor. He replied I was better off not calling anymore and that I should write instead. In the middle of this phonecall, my wife got home and found Zorro in his cold spot at the buttom of the stairs having trouble breathing. I told the officer that I had to go to bring our cat to the hospital. We brought Zorro to All Creatures - they took him away from us, told us that he was stable and that they were doing the chest x-ray. They sent us home - they called a little later and said they found fluid in his chest and wanted to draw it out. They also mentioned that he "might pass away" during the procedure. Horrified, we hung up the phone. They called again and said that the procedure went find and that they draw 60 ml out of the chest area around his lungs. After the call, we went back to see him. He was in an oxygen unit, half his torso was shaved. He also was on IV. He recognized us and began talking to us right away, but we weren't allowed to take him out of the oxygen tank to touch him. The doctor told us that they needed to test the fluid to see what it was and where it came from - another big question was: would more fluid come back? We said goodbye to Zorro, having no idea that this would be the last time that we would see him alive. This was the Wednesday night before Thanksgiving; we'd had plans to visit my family in Massachusetts for months. The doctor assured us that Zorro would get the proper care in the hospital, that they'd get the test results back to see if he had pneumonia or bronchitis or whatever it was and that Zorro would get antibiotics if he needed them. We were scheduled to drive to Massachusetts on Thursday morning. That morning, before we left, we got a phone call from the doctor on duty that the fluid had not come back on Zorro's chest and that he seemed to be breathing comfortably - outside the oxygen tank. He thought it fine for us to go - he had our numbers to give us updates and we planned to pick up Zorro (presumably healthy) either Saturday night or Sunday morning. Unfortunately, we couldn't visit Zorro on Thursday because the Hospital didn't allow visitors on the Holiday. We went to visit my family. Friday morning we got a call that he wasn't doing so good and that it could be FIP (this was the first time we heard about this), although it still could be a bacterial infection. If it was FIP, it was probably fatal. They didn't say anything about how fast it could act. We cried and were depressed, but still had hope that it was only a bacterial infection. He was on a broad array of antibiotics, just in case. That night another doctor called - they didn't have any more test results back (because of the Thanksgiving Holiday), but Zorro was still not doing so good. They'd given him an appetite stimulant; he'd eaten but thrown most of it back up. My wife was devastated. I asked about seeing him when we got home - we'd been hoping to pick him up Saturday night - and the doctor said we could see him but that he should stay there until Sunday. Looking back (hindsight is always 20-20) we should have left from home right then and there. It was about 9pm Friday night. We didn't. The next morning the doctor called and said that Zorro was worse - the prognosis was now "guarded". We moved our plans up and got out of there as quick as we could. About half way through the five-hour car ride home, they called and said that he was now very bad and that we should consider putting him to sleep. We wanted to say goodbye to him. It seemed like fate wasn't on our side; we hit traffic and what seemed like every single red light possible. We finally got to All Creatures; they told us that Zorro had died 10 minutes before. They brought in his body so that we could say goodbye - he was still warm. We cried our eyes out. My wife held, hugged and kissed him. I scratched his face in the place that he always loved it. We were (and still are) in shock, devastated, traumatized. We feel guilty for being away. We miss him so much and feel like we were robbed of one of our best friends. We have since learned that the vaccinations and Bordatella drops that the Vet at Central Veterinary Associates gave Zorro may have precipitated, worsened or even caused a dormant virus which 80% if all cats have, to mutate into the deadly FIP. We are heartbroken and stricken with grief. We went away Thanksgiving morning feeling good that we'd brought Zorro to a Hospital, sure that he'd be fine soon. When we got back, he was gone. One of the office staff told us that it was better that we didn't see him at the end, that he wouldn't have recognized us because he was so out of it. I don't know what to think. Did we cause this by choosing the Vet who over-vaccinated him? Is it all our fault? We would never, ever do anything to hurt our precious Zorro. If he could, would he forgive us? We were only trying to do what was right for him. Ten days ago, we had no idea that vaccinations can harm a cat. We trusted someone who's job it is to care for our pet. And now we feel terrible. We will miss you Zorro - forever - and we are sorry. We didn't do it on purpose.